When I started looking for information to write this post I did not think I would meet so symbolic design, so popular, as required, so spiritual, philosophical and beautiful at the same time. The lotus flower has been in the philosophy of many civilizations from China and India to Egypt and Greece, besides being one of the most important symbols of Buddhism and Hinduism. This flower it grows in the mud in stagnant water that has represented since antiquity a miraculous feat, since despite their environment petals shine with pure white. The lotus flower is the pursuit of enlightenment, knowledge, freedom without ties or imprisonments, a reflection of divinity, purity and eternity. 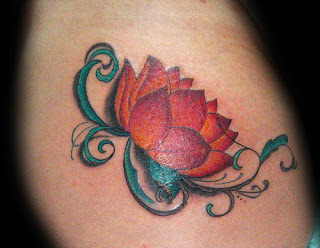 More than one reason to choose a tattoo of lotus flower, and no doubt you identify with any of them, I doubt that anyone at this flower tattoo only for its image, which is indeed very beautiful, since the load symbology that this drawing bears is too important to ignore, however any reason is valid in choosing your tattoo.